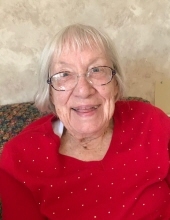 Alice Ruth Chuhralya, 90, of Hopkinsville, died at 8:00 a.m. Tuesday, February 05, 2019 at Christian Health Center. Funeral services will be at 11:00 a.m. Saturday, February 9, 2019 at Hughart, Beard & Giles Funeral Home with Rev. Fr. Michael Charles officiating. Burial will be in Constantia Rural Cemetery in Constantia, New York at a later date. Visitation will be 10:00 a.m. until the hour of service on Saturday at the funeral home. Hughart, Beard & Giles Funeral Home is in charge of arrangements. A native of Northampton, MA she was born October 15, 1928 the daughter of the late Alfred Fisher and Nettie Brean Fisher. She attended Austin Beauty School and earned her license as a beautician. She was also a homemaker and a member of Saints Peter and Paul Catholic Church. She was preceded in death by her husband, Stephen Chuhralya, Sr.; sons, Stephen R. Chuhralya, Jr., Richard M. Chuhralya and her brother, Raymond Fisher. Survivors include her son: Brion Chuhralya (Debra) of Stanford, KY; her daughters, Julia Waskiewicz (David) of Clarksville, TN, Gail Dittler (David) of Englewood, FL, Amy Watkins (Griffith) of Hopkinsville, KY; two sisters-in-law, Mary Sotak and Audrey Fisher, 11 grandchildren, 11 great-grandchildren and multiple nieces and nephews. Memorial contributions may take the form of donations to Grace & Mercy House, P.O. Box 4045, Hopkinsville, KY 42240. To plant a tree in memory of Alice Ruth Chuhralya, please visit our Tribute Store. "Email Address" would like to share the life celebration of Alice Ruth Chuhralya. Click on the "link" to go to share a favorite memory or leave a condolence message for the family.